A big thank you goes out to http://innerangelsandenemies.wordpress.com/ for nominating my blog for the Reader Appreciation Award! Had this award been given to me by someone else, YOUR web link would have been one of the first that I would have added to my own list to share! Add a picture of the award to your blog. These are some of my newer finds in the blogosphere, and I would like to nominate them for this award, and share them with you. Each of these blogs (including the one that nominated me for this award,) have served to warn me, teach me, and encourage me, and have been an added source of fellowship for me within the body of Christ. May you enjoy them even more than I have! If you see your blog up here on the list, then YOU have been nominated for this award! (See above note on how to accept the nomination.) Share with us some of YOUR favorite blog links! 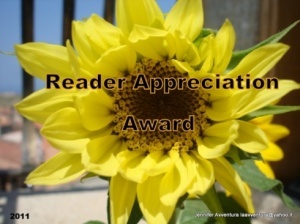 Many thanks for nominating my blog (http://newbon-bonsblog.blogspot.com/) for the Reader Appreciation Award. A very unexpected honor! I really enjoy reading your blog and there is always something to learn from your dreams and Godly wisdom. Thank you so much for my nomination. I look forward to reading the other blogs!